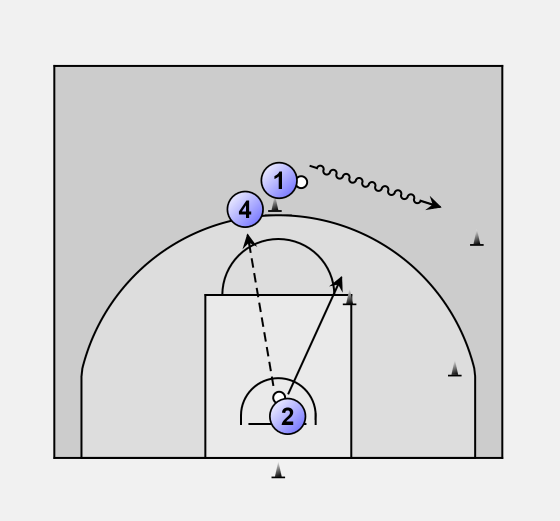 2 dribbles to the pylon at the sideline, while 4 goes to the high post asking for the ball. 2 passes to 4, 2 moves to 4 and cuts hard to the corner. 4 moves the ball and pivots to follow 2. When 2 cuts to the basket 4 passes to 2 who scores. After passing 4 goes to the top. 2 rebounds its own ball and passes to 4. At the same time 1 starts to dribble to the side line and 2 cuts to the high post repeating the drill.